Home > EBOOKS > In the Middle by Barry Oshry - Ebook. 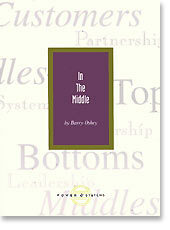 Presenting the eBook version of IN THE MIDDLE, Barry Oshry's pioneering work on middles. This can be read on all android and apple devices. Here is a free download link if needed for Adobe Digital Editions. Oshry illuminates life in "middle" positions in organizations -- positions in which supervisors, middle managers, coaches, deans, department heads and others must function between the often conflicting perspectives and demands of those above and below them. IN THE MIDDLE clarifies the stresses of middle positions, the disempowering pitfalls to be avoided, the strategies for empowerment, and the unique contributions empowered middles can make to the organization.